Photo description: Caroline Ackerman poses on the left and Caroline Boorman poses on the right. 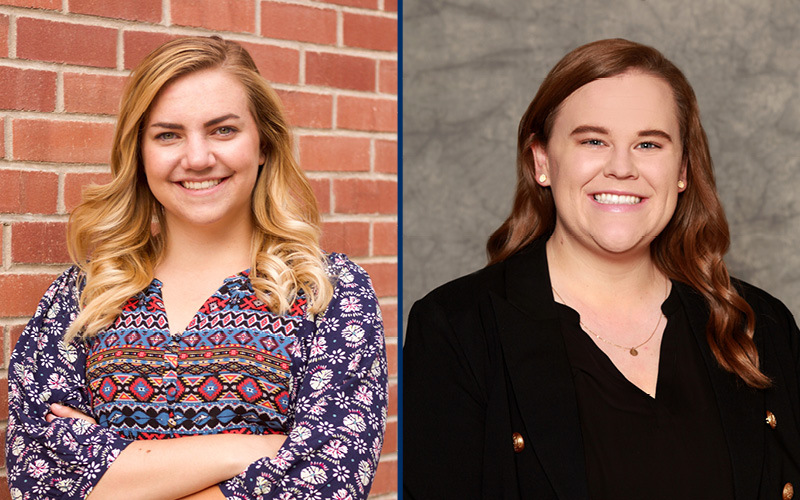 In November 2018, two recent Reynolds School of Journalism graduates, Caroline Ackerman and Caroline Boorman, achieved their Certification in Principles of Public Relations, an accreditation offered to young professionals through the Public Relations Society of America. They are the third and fourth Reynolds School students to do so. Ackerman and Boorman graduated from the University of Nevada, Reno in May 2018. To attain the Certificate in Principles of Public Relations program, PRSSA Nevada members, who are within six months of graduation complete an online study course, undertake a comprehensive exam certified by the Universal Accreditation Board. The online course serves as a refresher for public relations and advertising classes taught at the Reynolds School and ensures the applicant knows industry standards in business literacy, crisis communication and stakeholder analysis. Ackerman served as PRSSA Nevada Wolf Pack Relations executive director during her senior year in 2018 and held the chapter’s treasurer position previously. In spring 2018, she was hired from her internship at the Walker Basin Conservancy as an outreach and communications coordinator. During Boorman’s collegiate career, she served as treasurer for PRSSA Nevada and social media director for its student-run firm Wolf Pack Relations. She also competed in both the PRSSA Bateman Case Study and the American Advertising Federation National Student Advertising Competitions. Boorman is currently an account coordinator at MN|G Partners. “I’m exceptionally proud to have earned my Certificate in the Principles of Public Relations. I think obtaining my CPPR is a great start to my career and will help me with working towards becoming Accredited in Public Relations,” Boorman said. For more information about PRSSA Nevada or how to become a Certified in Principles of Public Relations, visit the PRSSA website.